Do most Christian scientists have a Literal Creationist viewpoint? I have been thinking a lot about creation lately, and I am just curious as to whether most scientists believe the literal account or if they believe in some form of theistic evolution. Only 40% of all Americans believe in a strict Young Earth Creation model (be that Genesis or otherwise) - the majority support some form of theistic evolution or natural evolution. When you look at those with post-graduate education, nearly 50% hold a theistic evolution view, with 25% supporting a naturalistic evolution view and only 22% supporting a young earth model. If we take "scientists" to mean those with a post-graduate degree involved in the active study of some natural science, then it would a reasonable (though quite unscientific) assumption to say that the majority of scientists their post-graduate peers and support the evolutionary model, either from a theistic standpoint or a naturalistic one. This obviously isn't firm evidence either way - there is some evidence that those in the natural sciences have higher rates of religious belief than those in more social sciences, but not to any extreme degree, and it would be a stretch to claim that scientists reject evolution at a higher rate than the general populace. It's also only looking at American data, but outside of Islamic countries, you're only going to see more support for evolution. I don't have any percentages or numbers, but there is a large number that believe in a literal historic interpretation of the Genesis creation narrative, and the number is growing all the time as more and more scientists are examining the facts for themselves and not just accepting the idea that someone in some other field of study has proven evolution and a billions-of-years timeframe to be true. As they discover that evolution is a philosophically and factually bankrupt theory, they are realizing that creation is not just a viable alternative, but actually a model that best fits the facts. An excellent book on the subject is, "In Six Days," subtitled, "Why 50 Scientists Choose to Believe in Creation." Edited by John F. Ashton - Master Books, Green Forest, AR 2005. It is the testimony of 50 scientists, with at least a PhD in a wide range of scientific fields, from several countries, who believe in a literal six creation. So, whatever the number is, it is growing. Scientists are not a single cohort, so when we find that some will agree and some will disagree, this provides little in the way of useful information unless we know what we intended to mean by 'scientists' and then understand the profiles of the scientists. Richard Dawkins says, in The God Delusion, page 100, that a study by Larson and Witham appeared on the leading journal Nature, showing that of the American scientists who had been elected to the National Academy of Sciences, only about 7 percent believe in a personal god (E. J. Larson and L. Witham, “Leading scientists still reject God”, Nature 394, 1998, 313). members of the Academy are the elite research scientists we tend to think of when we use the word 'scientists. Dawkins says that religious believers form about 40 percent of the less eminent scientists in the United States. On pages 101-2, Dawkins describes a study in Britain, undertaken by R. Elisabeth Cornwell and Michael Stirrat, involved sending a questionnaire to all 1,074 Fellows of the Royal Society who possessed an email address, offering several propositions and asking the scientists to rank their beliefs on that point from 1 to 7. About 23 percent responded (ie about 247 respondents). The preliminary results available to Dawkins at the time he wrote, indicate that 3.3 per cent agreed strongly (chose 7) and 78.8 per cent disagreed strongly (chose 1) that a personal god exists. A total of 12 Fellows chose 6 or 7 to indicate that they were believers, while 213 Fellows chose 1 or 2 to indicate that they were nonbelievers. These surveys indicate that a substantial majority of elite scientists do not believe in God and therefore, of necessity, do not believe in literal creation. Dawkins does not provide comparable figures for Britain, but a smaller majority of the less eminent scientists in the United States do not believe in God. Those scientists who are, in fact Christians, would comprise a mixture of those who believe in a biblically literal creation and those who do not. Newsweek (June 29, 1987) is claimed to have reported "By one count there are some 700 scientists (out of a total of 480,000 U.S. earth and life scientists) who give credence to creation-science, the general theory that complex life forms did not evolve but appeared 'abruptly'." The statistics I provided previously suggest that the total number of Christians among the scientists in this category would be many thousands, so the 700 who believe in creation science are a quite small proportion of Christian earth and life scientists. Dr. Lara Wieland and Dr Carl Wieland, founders of the Creation Science Association, are medical doctors, not PhD-qualified scientists. Arlton Murray received a D. Sc. (Doctor of Science) in 1981 from the Sussex College of Technology in London, and worked as a preparator for the Smithsonian Institute not as a scientist in the normal sense of the term. The Sussex College of Technology is widely described as a'degree mill' - see for example, Corporate Fraud, page 517, by Michael J. Comer. The question you are asking varies with time and country so putting an accurate number on this will be tricky; since some countries the idea of evolution and creationism will be foreign to them. 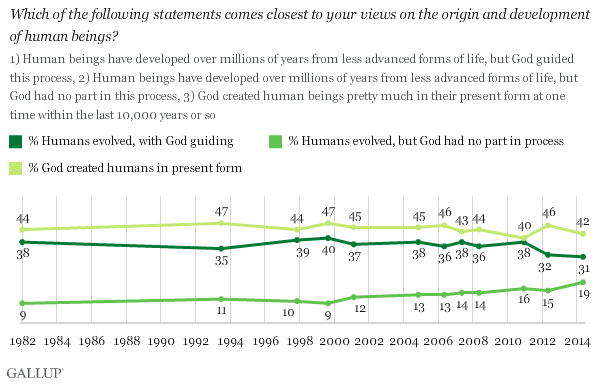 A chart showing a survey done on Americans view of Creationism vs Evolution over a timespan of over 30 years. From the table, although not scientists but college graduates 68% believe in evolution and not in creationism (1000 yo earth). This figure should be close to the one you are looking for. Most believe in evolution. They believe that, yes, God literally created the Universe- via the Big Bang. For many years, atheists maintained that the Universe had NO beginning. The Big Bang theory more or less disproved this. HOW ON EARTH such groundbreaking support became a banner for atheists to rally under as 'their thing' (along with evolution)- I have no idea! Not the answer you're looking for? Browse other questions tagged creation science or ask your own question. Why does Intelligent Design reject evolution, even intelligently designed and executed evolution? Why did the Catholic church stop supporting Genesis creation? What did Luther consider to be novel in his theology of creation? Does Catholicism teach that Jesus was a theistic evolutionist? What influence did Greco-Roman philosophy have on the doctrine of “creatio ex nihilo”?